Except as otherwise stated in company literature the price shall exclude delivery and you will be liable to pay the company’s specified delivery charges. Premium delivery charges (timed and weekend deliveries) are non-refundable once the delivery has been completed by our delivery company. If you wish to cancel any order you may do so at anytime after an order has been placed, or up to 30 days after the date of delivery. All notices of cancellation must be given to the company in writing. In the event that you cancel an order after delivery you must inform the company in writing within 30 days. The goods must then be returned at your own expense to the company within 14 days of your notification to cancel your order. If you are unable to return the goods you must make the goods available for collection upon request and within 14 days of your notice to cancel your order. This will be at your expense and you will not be entitled to a refund of the original delivery charge. The company will be entitled to charge you (an equivalent amount to the original delivery charge) for this collection. These conditions will still apply in the event of any discount/special offer applied to delivery charges. The company will not be liable for any costs incurred in the return of cancelled orders. The goods will not be deemed to have been returned until notification is given by the company that the goods have been returned to the address advised by the company. It is your responsibility to return all goods in the same condition as they were upon delivery. The company reserves the right to deduct from the refund any charges necessary for the repair or cleaning of any goods returned not in the same condition as upon delivery. You are advised to retain the original packaging in the event of you cancelling an order. The company retains the right to charge for any necessary packaging/re-packaging. The company shall be entitled to recover all costs, loss, charges, and expenses incurred in connection with goods returned not saleable as new. Should the product prove to be faulty or the wrong item has been delivered, we will not charge a handling fee and provided the item is returned within a 30 day period we will refund the cost of delivery back to you upon proof of payment. The ABP Retail Ltd return policy does not extend to business-to-business sales, bespoke or branded products, or to products shipped outside of mainland UK. This does not affect your statutory rights. In the event of non-delivery by any of our carriers, a replacement or refund will not be issued until 15 working days have passed since dispatch (20 working days for international deliveries). We will accept no liability for non-delivery if an incorrect delivery address is provided by you or any agent/payment provider acting on your behalf. The term ‘The Airborne Shop’ or 'ABP Retail Ltd' or ‘us’ or ‘we’ refers to the owner of the website whose registered office is Terence House, Denman Street East, Nottingham, NG7 3GX. Our company registration number is 6009028. The term ‘you’ refers to the user or viewer of our website. The information contained in this website is for general information purposes only. The information is provided by The Airborne Shop (ABP Retail Ltd) and while we endeavour to keep the information up to date and correct, we make no representations or warranties of any kind, express or implied, about the completeness, accuracy, reliability, suitability or availability with respect to the website or the information, products, services, or related graphics contained on the website for any purpose. Any reliance you place on such information is therefore strictly at your own risk. Through this website you are able to link to other websites which are not under the control of The Airborne Shop (ABP Retail Ltd). We have no control over the nature, content and availability of those sites. The inclusion of any links does not necessarily imply a recommendation or endorse the views expressed within them. Every effort is made to keep the website up and running smoothly. 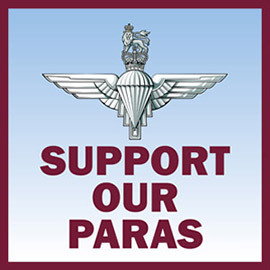 However, The Airborne Shop (ABP Retail Ltd) takes no responsibility for, and will not be liable for, the website being temporarily unavailable due to technical issues beyond our control. This website and its content is copyright of ABP Retail Ltd - © ABP Retail Ltd, 2019. All rights reserved.